The injustice that was the Komagata Maru incident was one of the first things my teacher talked about in grade 11 social studies and the name has always stuck with me. In 1914 a Japanese steamship carried 376 passengers (all British subjects) from Punjab, India over to Vancouver by way of Hong Kong, Shanghai, and Yokohama. Upon arriving in the harbour, the ship was not allowed to dock and 356 passengers were denied entry to Canada because they were South Asian. 1914 – S.S. Komagata Maru and Canadian officials. Archives Item# CVA 7-125. 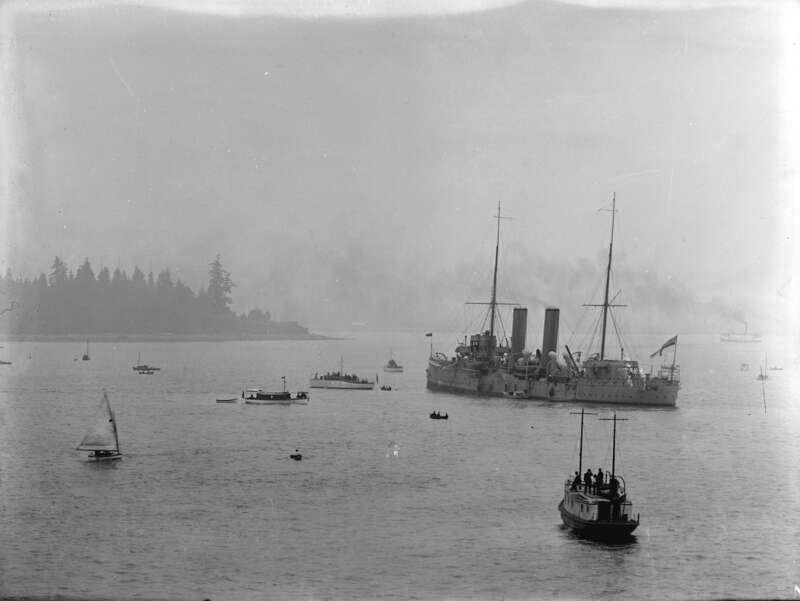 Unable to come ashore in Vancouver, and due to a lack of supplies for the return trip, the ship sat in the harbour until it finally made a return trip to Calcutta, India with all of its passengers. There, it was met by police. 1914 – H.M.S. “Rainbow” in Vancouver harbour to watch over the Komagata Maru. Since that time, and starting in the 1980s, official government apologies on various levels have been offered. In 1989 a plaque commemorating the 75th anniversary of the departure of the Komagata Maru was placed in a local Sikh temple and a plaque commemorating the 80th anniversary of the arrival of the ship was placed in the Vancouver harbour in 1994. There is also a mural on the side of a building in Surrey (near Strawberry Hill, Scott Road and 72nd) that commemorates these events. Almost 100 years later, the Federal government of Canada has pledged to work with Vancouver’s Khalsa Diwan Society and the Vancouver Parks Board to fund and create a monument at Harbour Green Park in Coal Harbour. Update July 23, 2012: The monument was unveiled today in Coal Harbour. From the Vancouver Sun: “In a day like today, where Canada really embraces multiculturalism in a different way, it’s startling for people to think that 98 years ago it could have been so different,” said Vancouver park board commissioner Niki Sharma. “We’re a country built on immigrants so the policies of the past really help us to realize how important it is to not go back there again. The monument was designed and created with $82,500 in federal funds and an additional $104,000 came from the Canadian government to develop a museum at the Ross Street temple. Wow, that’s crazy what Mayor Baxter said back then… in all my travels, I find Vancouver one of the most tolerant cities in the world. Thank you for blogging this, Rebecca. It is very encouraging to hear that the sacrifices of those pioneers will finally be recognized and their legacies honoured. Thanks, Rebecca, for your piece about this important and ugly moment in history as a reminder to all of us. You’re right that this is not one of the prettiest moments in Canadian history, and much of the oppossition to the Sikhs landing was to keep Canada white. However, I’m always a bit disconcerted by one-sided history. You do not mention that the Sikhs on board the Komagata Maru did have their day in court. The decision of the B.C. Supreme Court at the time was not based on race, but rather on the qualifications of the Sikhs on board. At the time, Canadian immigration favoured those who were intending to settle in the Prairies, and who were suited to be farmers. Most of those on board the Komagata Maru intended to settle in Vancouver and be labourers (there was actually a recession on the time which explains much of the hostile reaction of Vancouver residents). It was also one of the main reasons the court gave in refusing the Sikhs admission to Canada. It also didn’t help that very few Sikhs on board had the required $200 that was necessary for immigrants at the time to have, and while local supporters of the Sikhs were able to raise the money for them, this did give the authorities one more reason to keep them out. I think if you read the letters-to-the-editor at the time (which I have), you will find less racism than you would imagine. Many letters, in fact, point out the shortage of work in the Vancouver area at the time. There is a very good book written on the subject (far better than any online source I have seen; most online sources are very revisionist and politically correct). You should read it. This event is far more complex than you are presenting it in your write up. @ssorcron I tend to keep my blog posts fairly short but am always interested in researching the history of the area. Thank you for the additional information. It sounds horrible, doesn’t it? But of course we continue to react in the exact same way they did back then. Of course, now we are much more careful with our words. Making sure to label them terrorists instead of saying things that might label us as racist. But this story has been repeated many times in Vancouver and Canada. Its the ugly side of us that we pretend doesn’t exist. The last time was only two summers ago. Remember the “Tamil Tiger boat”? How short our memory becomes when it reflects poorly on us. And again in 1999 when some 600 Chinese migrants arrived at the shores of British Columbia. Will we build monuments for these wrong-doings? Probably not. Well, maybe in 100 years when future generations judge us, label us, and try to distance themselves from our actions. Unfortunately, I doubt they will be any different either.